Tree felling is something we'd rather not do, to be honest. Trees are wonderful living things and we find them interesting and worth saving whenever possible. 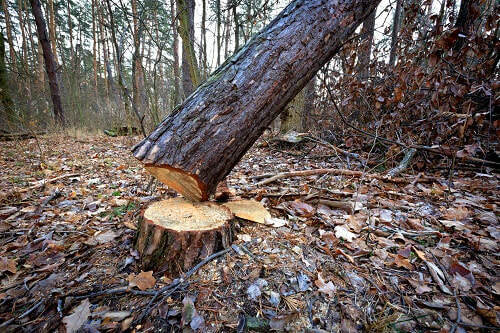 But there are times when the only sensible option is to fell trees. It may be because land needs to be cleared for housing or other building or construction work. Or sometimes we remove trees because roots are undermining structures or damaging drains and there's no way to remove the roots without killing the tree. Sadly unsuitable trees are often planted too close to buildings so eventually they become a problem and either cause damage or steal too much light. It's a shame because if a tree is growing well, it means it's happy. But not all trees are happy because a lot of diseases are striking the trees in our gardens. Ash trees are taking a beating at the moment and elms fail to thrive, although they might sprout up and live a few years before the dreaded Dutch Elm Disease claims them. Honey Fungus threatens a lot of trees too and when some of these diseases strike there's no option but to remove trees and dispose of the timber sensibly so it doesn't spread to other trees and shrubs. Leyland Cypress trees are frequently removed because they quickly grow to an enormous size if given a chance, and that fast-growing hedge can soon turn into a row of huge, top-heavy trees that need to be felled.